OC Prudent Bear: Readers Say Prices to Drop 15 to 20% in OC! 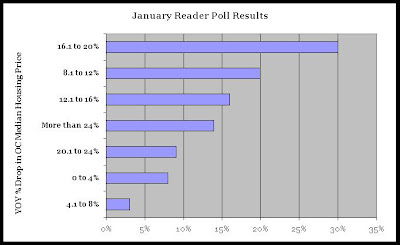 The results of January's reader poll are in and they paint a very dismal picture for OC's housing prices for 2008. Thanks to everyone who voted in the January poll regarding their predicition on this December's YOY pricing change. While being a died-in-the-wool bear myself, I have to admit that even I was a bit surprised by the outcome as reader's of this blog have an such an overwhelming negative view of pricing strength here in OC. As one can see from the chart above, the most common sentiment (30%) expressed in the poll (the mode) was that prices in OC were set to drop between 16.1 and 20%. The weighted average of the votes (the mean) expressed that readers felt collectively that prices would drop 15.6%. If you recall, the median price dropped in OC 10.2% between Dec2006 and Dec2007. So, the largest plurality of poll respondents seems to believe that this year prices will drop between roughly 150 to 200% as much as last year! And on average they expect to see prices by 150% as much! Pricing optimism was very hard to find in poll responses--only 11% of respondents felt that prices in OC would drop 8% or less this year; actually, more respondents (14%) think prices will drop 24% or more! All things considered, I would offer that this crowd on the whole seem to believe that prices will drop between 15 and 20% this year. Quite a drop and quite the boon for bears if our collective wisdom is correct.